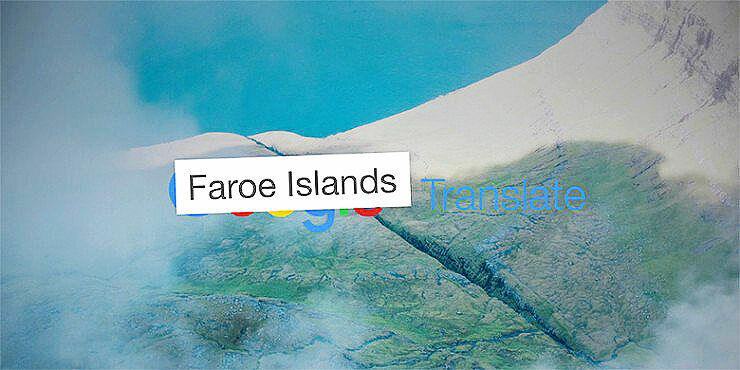 FaroeIslandsTranslate.com (Speak + Music).The tiny Faroe Islands are once again taking on giant Google in a bid to have their unique language included on Google Translate. They have created their very own Faroe Islands Translate. With less than 80,000 people speaking Faroese worldwide, and a growing tourism market, the Faroe Islands realise that not being included on Google Translate has frustrated visitors who can’t fully immerse in their unique traditional culture by learning a few phrases in Faroese. Creating their very own version of the online translation service, with the help of locals who will translate live by video, Faroe Islands Translate will provide a free online service for those visiting the destination or, in fact, anyone around the world curious to learn a little of this unusual language. From sheep farmers to school teachers, chefs to social workers, this initiative provides an opportunity to see the friendly Faroese before visiting, and to gain a window on their magical world. Try yourself at www.faroeislandstranslate.com. If you want to learn Faroese, the language spoken by the people of the Faroe Islands, an archipelago of 18 small islands in the North Atlantic—forget Google Translate. Because it's not on there and the islanders are doing something about it, by attempting to get inclusion in the service by providing their own version. Faroese is spoken by fewer than 80,000 people across the globe (it also has 37 words for fog) and due to its exclusion on Google Translate, it means visitors who want to learn local phrases are unable to, as they might Spanish, Welsh, or Slovenian. It's a frustration that Faroe Island locals, the tourism board and the prime minister (who penned an open letter to Google - see video below) decided to tackle themselves in a group effort. That group effort has found form in the Faroe Islands edition of Google Translate, called Faroe Islands Translate. Anyone wanting to learn a word or phrase in Faroese can head to the site, type in what they want and it will be translated. Not only that but you'll get an added personal touch too which you don't get with Google. Because once you type in your phrase, providing it hasn't been translated already, it will get sent to a random Faroese person and translated and delivered to you in a short video clip. We tried the phrase "We are thrown into existence" but didn't hear anything back. Maybe it was too existential. You can, however, find an already substantial database of translated phrases which includes "I'm Pickle Rick" and "I like turtles" among many more. Have a go yourself on 'Faroe Islands Translate' and see what happens. “Whilst most Faroese people speak good English, we have a beautiful language of our own that we would love to share with those who visit, and with the wider world in general." explains Faroe Islands Translate Project Manager, Levi Hanssen of Visit Faroe Islands. "When traveling in most countries, tourists can use Google Translate to help them to communicate with local people and to feel as if they are a true part of the destination that they’re visiting. Sadly, in the Faroe Islands, this isn’t currently possible—and we want to change that. This is not the first time the Faroe Islands have had to take things into their own hands to get Google to listen either. Last year the they petitioned Google to get Street View by creating their own unique version of the service, called Sheep View. Which, as you can guess, used cameras mounted on sheep to capture the islands. And it worked too, because Google eventually sent some cameras and now the Faroe Islands are viewable in Google Street View. This latest campaign hopes to get the tech giant to add them to Google Translate too. Check out and learn some Faroese here and learn more about the Faroe Islands here.